Home > Fire Safety & EMS > Fire Safety Evacuation Supplies & Tools > Fire Extinguisher Arrow Signs > Metal Fire Extinguisher Arrow Sign - 8" x 12"
Home > Fire Safety & EMS > Fire Extinguisher Arrow Signs > Metal Fire Extinguisher Arrow Sign - 8" x 12"
Home > Fire Extinguisher Arrow Signs > Metal Fire Extinguisher Arrow Sign - 8" x 12"
Clearly mark your fire extinguisher locations with these aluminum Fire Extinguisher Signs. These bold red and white down arrow signs are silk screen printed on heavy gauge aluminum, then oven-baked for extra durability. The metal signs feature pre-drilled mounting holes, rounded corners and smooth finished edges. Perfect for mounting on block or concrete walls. 8 or more qualify for Free Shipping. Orders 20 or more will ship UPS Ground. 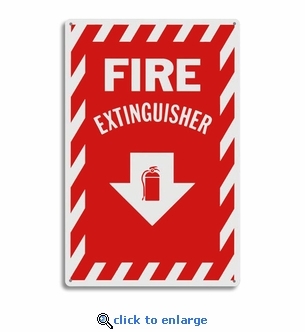 Metal Fire Extinguisher Arrow Sign - 12" x 8"